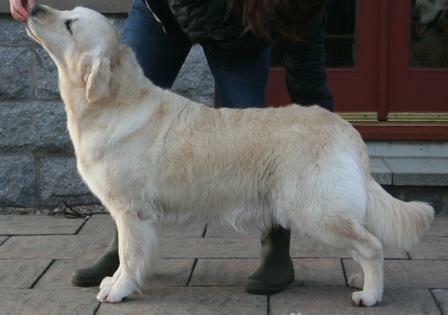 Gidget was bred in Holland by my good friend Gerdine of Dazzling Gold Golden Retrievers. She arrived in Canada on a sunny April evening after spending her first night away from home at the Hilton Hotel at Schiphol Airport in Amsterdam. She was a great little traveler, easily sleeping the long flights away in the comfort of her soft crate at my feet in the aircraft. She grew up to be a beautiful girl, and we are thrilled with her. She has personality plus, is always smiling, and we adore her. To know Gidget is to love Gidget. 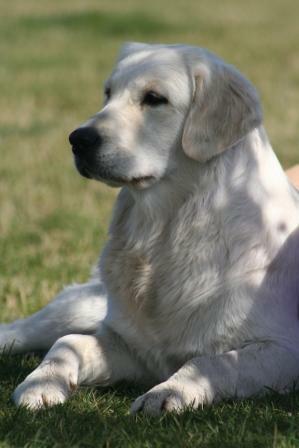 This sweet extreme cream girl finished her Canadian Championship under Australian judge Ms Susan Shrigley, a sporting dog breeder, at the Evelyn Kenny shows in the summer of 2006. She had a lovely win under respected breeder judge Mr Michael Faulkner at the huge Alberta Kennel Club summer show in 2005, a thrill for me which put her well on her way. Gidget and I were described as a “beautiful working team” when we finished our CD in grand style with a High In Class and a score of 195 at the Cal-K9 obedience trials in November 2006. Gidget’s enthusiasm for working is infectious and she is truly a joy to train with. Gidget teaches me as much as I teach her and we have a mutually beneficial partnership! I continue to be enamored by her charms. We are continuing our training in Scotland and are members of the Aberdeen Canine Training Society. Recently we entered our first obedience show in the UK and Gidget worked like a dream. She placed first in her class and came home with two trophies…one for winning her beginners class, and one for being first of another breed other than a BC, WSD or GSD. We received many compliments on her wonderful style and beautiful heeling. It was a lovely day in Arbroath. **FLASH** Gidget wins again! At the Aberdeen Canine Training Society’s 2010 Obedience Show, Gidget placed 1st in Beginners class on Saturday and 3rd on Sunday. Once again, her heel work received high praise, and the ring steward thought she was “adorable”. So do we! Gidget is now retired from breeding. She has produced some lovely babies.. Thank you Gerdine for sending Gidget our way! She is truly a gift. She is not retired from working though and recently added a Rally Novice title to her list of achievements.